Why? Because dreaming and visualizing actually relaxes you…and in effect slows down your momentum. Also, ignoring your fears is an avoidance tactic which in itself is a poor way to progress towards a goal. But properly identifying and listing your fears, then tackling them one by one creates progressive wins, confidence, energy, and momentum! In column 2 – List all of the things you could do to minimize all those terrible things. In column 3 – List things you would need to do to get back to where you are from each potential setback. STEP 2. Rehearse the worst case scenarios. 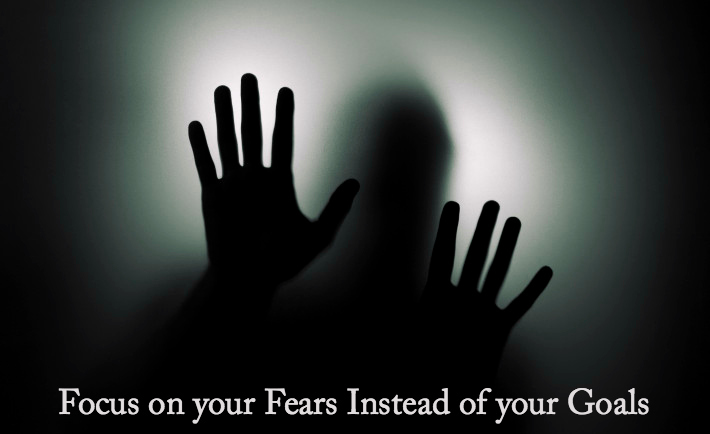 Yup, carve out a few days in the next couple of weeks to tackle a major fear on the list – facing it and living it! So say your goal is to quit your job and your fear is that you don’t interview well, apply to some random positions and get an interview at a company, any company, just to force yourself to go through the process – or have a friend, mentor, or coach give you a mock interview. What you’ll find is that what you feared in your mind is often a 100 times worse than reality. Also, that the strategies you’ve listed to get back on track after facing that fear actually work!! Now, do it again, for each action or obstacle you feared…and you’ll start to see a pattern – our fears are more often lies we’ve sold ourselves, but they serve a purpose if we face them – they prepare us for success! If you’d like to see a great little video on this concept, check out Tim Ferris’ presentation at Google!